This lyrical tragedy of two star-crossed lovers and their feuding families is one of the world's most famous love stories. 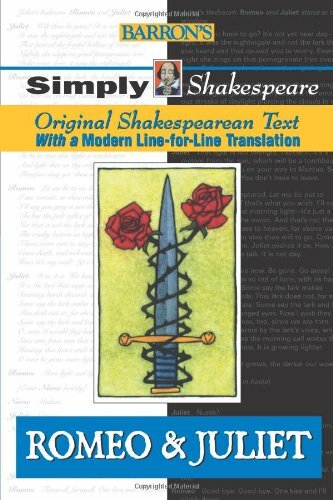 Books in this new, illustrated series present complete texts of Shakespeare's plays. However, the lines are set up so students can see the bard's original poetic phrases printed side-by-side and line-by-line with a modern translation. Shakespeare's plays were popular entertainment for London's theatergoers. His Globe Theatre was the equivalent of a Broadway theater in today's New York. The plays have endured, but over the course of 400+ years, the English language has changed in many ways—which is why today's students often find Shakespeare's idiom difficult to comprehend. Simply Shakespeare offers an excellent solution to their problem. Introducing each play is a general essay covering Shakespeare's life and times. At the beginning of each of the five acts in every play, a two-page spread describes what is about to take place. The story's background is explained, followed by brief descriptions of key people who will appear in the act, details students should watch for as the story unfolds, discussion of the play's historical context, how the play was staged in Shakespeare's day, and explanation of puns and plays on words that occur in characters' dialogues. Identifying icons preceding each of these study points are printed in a second color, then are located again as cross-references in the play's original text. For instance, where words spoken by a person in the play offer insights into his or another character's personality, the "Characters" icon will appear as a cross-reference in both the introductory spread and the play proper. Following each act, a closing spread presents questions and discussion points for use as teachers' aids. Guided by the inspiring format of this fine new series, both teachers and students will come to understand and appreciate the genius of Shakespeare as never before. The magnificent, timeless drama is the world's most famous tale of "star-crossed lovers." The young, unshakable love of Juliet and Romeo defies the feud that divides their families--the Capulets and Montagues--as their desperate need to be together, their secret meetings, and finally their concealed marriage drive them toward tragedy. A masterwork that has long captured the hearts of audiences, this romantic tragedy has become part of the literary heritage of all peoples in all nations.